Are Mermaids, Unicorns and Dragons Real? Science doesn't explain everything. It doesn't explain very much at all, really. You realize the depth of the holes in our understanding of the world when you have a kid. Kid brains are unchained and cage-free. There are a few magical years where kids don't discern a distinction between fantasy and "reality" (at least as adults limit it), and they're old enough to share it with us. That is my daughter, freshly 5 and full of powers. Beyond the questions that are impossible to answer ("What do you think that cloud is feeling? "), she's a robot from outer space. Bettie Anne can turn into any singer she hears on the radio. Her Magical Eagle Eyes can see all the way around the world and back and forward in time. She can jump higher than the moon and turn socks into ice skates on the kitchen floor, and when she touches water, she sprouts a tail and turns into a mermaid. As far as she believes, these are facts. And maybe they are. How do I know she has not tapped into a dimension of existence that I'm unplugged from, instead of the other way around? This became clear last week, when we tragically lost both of our family dogs only three days apart. Giselle the poodle's sudden blindness turned out to be a brain tumor, and we lost her quickly. Three days later, our furry mutt Stitch stopped eating and moving. The vet found advanced colon cancer, and we lost her the next day. While my husband and I darkly mourned the loss of the dogs we'd loved since before we'd even loved each other, little Bettie sat in the living room giggling. "Giselle licked me," she squealed. "Oh, Stitchy, don't be jealous." She's in denial, I thought. She's pretending. Until one day, I was sitting at my desk when I heard Giselle sneeze, the way she always did for attention. I reflexively reached down to pet her, only to find empty air. In place of her curly fur, goose bumps crawled up my arm and covered my body. "That's her ghost kissing you," Bettie interjected matter-of-factly, before I could say out loud what had happened. For a minute, I believed my child. I needed an explanation of the incomprehensible, using something somehow parallel to, yet opposite of, science and logic. After all, both science and imagination seek to explain the unknown. Right now, science was failing me. Call it imagination or make-believe or myth, but approaching questions from a different perspective is an important part of being a human. Mythology has been around as long as we've had questions we couldn't answer, and there still are infinity things that we cannot explain. There's still a place for myth today. 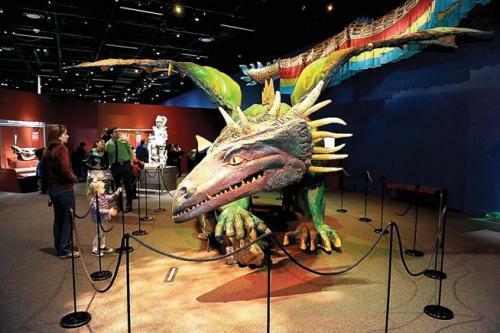 Sometimes we invent mythical creatures: dragons, Bigfoot, unicorns, mermaids. Sometimes we become them ourselves -- like my daughter, the brave mermaid in the vast and mysterious Atlantic Ocean. 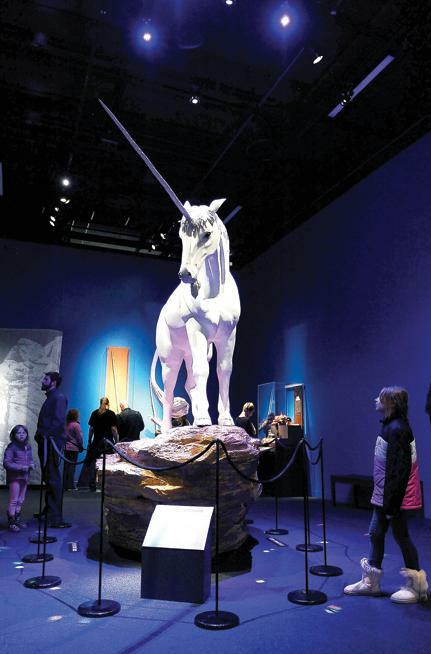 The Denver Museum of Nature & Science's new exhibition, "Mythic Creatures," examines the concepts of myths via fossils and cultural objects that express this modernly disregarded sliver of our history and souls (even if we forget ourselves as we grow older). The exhibition also shows how science has evolved, from "proof" of unicorns via a narwhal tusk from the North Sea or ancient elephant skulls as proof of the Cyclops. Makes me wonder what my daughter's daughter and beyond will put on display and chuckle about when they look back at today's society. They couldn't hear ghost-dog sneezes! They took the lack of a physical body as "proof" of death! Ha! You could argue that children are like ancient minds, lesser evolved, because they still believe in things we consider pretend, like mermaids. Yes, you could argue that. If you knew for certainly certain that mermaids would never someday be discovered in the pit of the ocean where no human has ever traveled. But then, if you knew that, you'd have to be able to see around the world and into the future. Which, as I understand, means you'd have to be sporting Magical Eagle Eyes. And, anyway, I'm not ruling out the possibility of a pegicorn as long as we live among the venomous, furry duck-beaver-otter-mole with fish eyes. You know, the platypus. The article originally appeared on the Boulder Daily Camera. Read more stories from the weirdest city in America, Boulder, Colo., here: Only In Boulder.